Still working hard on this beautiful, large embroidery design. Wouldn’t you know that right in the middle of working on this fabulous design Clothilde decides to start making this loud noise? It certainly did not sound healthy. Pleas went out to our beloved tech who returned the call from Trinidad. She is so good at what she does that she was able to direct me on taking off the body of the machine and oiling some obscure part in the internal mechanism. She said she would call the following day to see if it worked. If it did not work, I was to run the machine and when I heard the noise, I should apply some pressure on a wire that weaves itself throughout the machine. The oiling went well and Clothilde began purring like a kitten, again. Then the noise began. At first it was low then louder until it reached a crescendo. Slight pressure was placed on the wire to no avail. Then more pressure was placed on the wire and the noise went away. So, there I was embroidering and handling that with one hand while the other hand was holding the wire. The embroidery was completed and we simply turned the machine off until our tech called the following day. Visions of large, expensive, mechanical parts danced through my brain all day. Finally, she called. “Get a 7mm open end wrench and a pair of pliers,” she said. George was summoned since I have no idea what an open end wrench is. I did know what a pair of pliers looked like. Out of his magic room of tools George appeared with the tool. Hold the end of the wire with the pliers and give a few turns of the wrench to the nut and that’s it. That’s it? She told me that I could purchase a gauge to tighten the wire to specs. Yes, I definitely want that. How much is that fancy gauge going to set me back? $20 plus shipping. Holy cow! That’s it? I ordered my gauge immediately. Our Clothilde is back in business and George and I are proud as peacocks that we now know how to handle the noise issue. The waiting time was put to good use because we cleaned both houses while waiting. Handkerchiefs seem to be big business these days. I’ve written about the booger hanky several times. Wedding handkerchiefs are the main handkerchief sales for most embroiderers. I must say that we’ve sold many men’s hankies and women’s non-wedding handkerchiefs, as well. Most of our customers say they like that our hankies are unusual. They certainly aren’t your run of the mill handkerchiefs. I started out hand sewing the rolled hems around the hankies and then applying the embroidery. Then I realized that many handkerchiefs these days have serged edges. I have a serger and it is easy to use, so, why not? I serged the edges of hankies for awhile and then would apply the embroidery. When Clothilde came to live with us and we got the big embroidery hoops, I digitized the entire hanky in-the-hoop with a pretty little satin stitch edge. Tear away stabilizer was used with cloth pinned to the top. 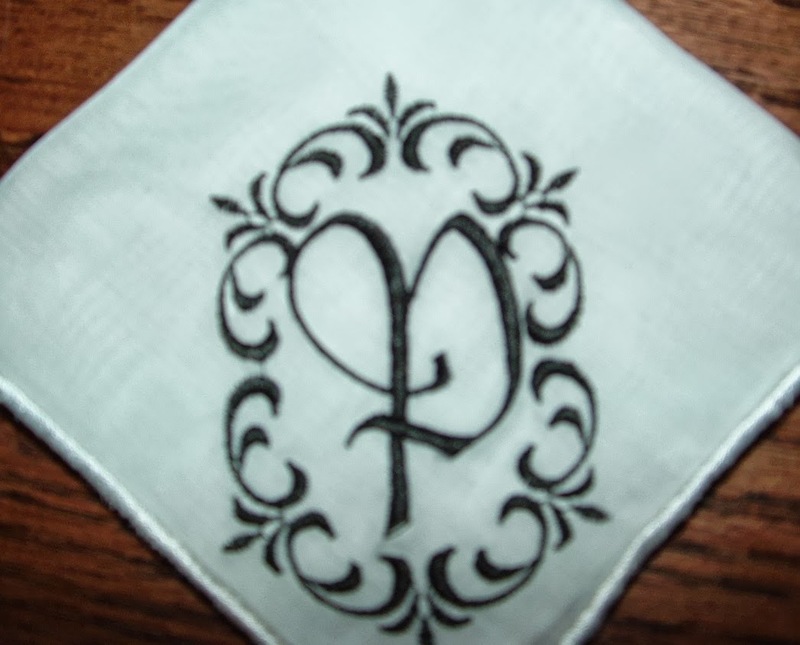 The outline of the hanky would stitch as an appliqué. The excess fabric would be cut from around the outline. Then the rest of the hanky would stitch. In the end the stabilizer was simply ripped off and voila, we had a beautiful hanky. Hanky in-the-hoop is pretty unique but not as unique as I wanted. In the meantime, I was all over Pinterest, Etsy, and the internet looking at gorgeous heirloom and antique handkerchiefs. It still baffles me how these women of old would hand stitch and embroider these elegant handkerchiefs. Several times I’ve attempted to embroider and/or attach lace to the handkerchiefs. The problem is that if the lace is embroidered onto the hanky, there is no way that the stabilizer can be removed prior to sale. It is just too hard and time consuming to remove those little bits of stabilizer. I did a few hankies where I did the lace separately on netting, cut out the lace and hand stitched the lace corner onto the handkerchief. The handkerchiefs sold but it wasn’t what I wanted to achieve. Recently I digitized a scalloped edged, in-the-hoop handkerchief. Love, love, love it! Then I was playing around with different shaped handkerchiefs. Thing were working out pretty darn good. I decided that since Christmas is approaching, I should create a Christmas hanky, which I did. The beautiful, metallic, Christmas design has a very light density. When I went to rip off the stabilizer I couldn’t get all the little pieces out. Just like the lace handkerchief. I had some white organza that I hooped and used like the stabilizer with the cloth pinned to the top for the appliqué. This worked out well except the end result was that the handkerchief is now lined with organza. Since I used the organza as the stabilizer, the handkerchief had to be cut from the handkerchief. And, since organza is shear, little pieces are not seen. I thought about cutting the organza away from the inside of the handkerchief, but then I had to deal with the embroidered motif. The motif didn’t have a distinct outline. I just had to deal with a lined handkerchief. The two red, Christmas handkerchiefs were taken to a friend’s home where I showed the girls the difference and asked their opinions. Hands down, they loved the lined hanky and did not mind the fact that it was lined at all. Never satisfied, the idea of the lace hanging off the handkerchief’s edge continued to entice me. Finally, I decided to use the organza as the stabilizer; use the scalloped hanky as the appliqué pattern; and, insert an outlined lace design to the edge, partly on the hanky fabric and partly only on the organza. It worked! I was able to trim the organza off from the outside of the handkerchief, and trim the organza from the inside up to the outline of the lace design. Unless I can figure something else out, the light density designs without outlines will still require the hanky to be lined with organza. One last point on the making of handkerchiefs with an embroidery machine is the use of netting or toile as the stabilizer. I have used netting as a stabilizer and it does work. Hoop the netting as the stabilizer and continue as I did with the organza. Even the off the edge lace will work. The issue with the netting is if the stitches are smaller than the netting squares, they will just hang there because there is nothing to attach. The netting itself looks like a part of the lace, which is a bonus. The netting is pretty easy to trim. I have not used toile but I think the little squares would be too dense to look like lace and not shear enough to conceal when trimming. But you never know until you try. We had a wonderful visit from George’s sister, Kathie, yesterday. We enjoyed the afternoon at Paradise Bar & Grill and then back home. It started out a rainy day but cleared up for an enjoyable afternoon. She only lives an hour away in Fairhope, AL but we rarely see each other. Since my Mama has passed on and George’s mother has passed away, we are all thinking that we should make a point of getting together more frequently before we can’t anymore. A friend of mine called me the other day and said the Gulf Breeze News posted on Facebook asking for someone who does monogramming. By the time I got to the post several people had posted to use different embroiderers. In fact, there were wonderful people who even said to call Cajun Stitchery. I posted simply that I do monograms and how they could get in touch with me. It became a voting contest with all of the people saying to use me or others. It was funny, actually. Not long afterwards I noticed that I missed a call. I returned the call and it was the Gulf Breeze News. The lady told me that I probably have the job because I was the only embroiderer to call her back. Lesson learned. I’ve given them a quote with references and we are just waiting right now. In fact, we gave several quotes this week to Facebook friends. Enough for now. Let’s see what next week will bring. The man at the counter asked the older boy, 'Son, how old are you?' Eight,' the boy replied. The boy replied, 'Not exactly, but they aren't for me. They're for him. He's my brother. He’s four. We saw on TV that if you use these you would be able to swim and ride a bike. Right now, he can't do either one. Still working hard on this beautiful, large embroidery design. I saw a pattern for an embroidered muff the other day. It reminded me of my mother’s wedding to my step-father. My sister and I had a real cute white furry hat and muff. We more or less shared. The day of Mama’s wedding we both wanted to wear the hat and muff and began to argue. Mama decided that one would wear the muff and the other the hat. There is a picture of Mama and Daddy leaving the church after their wedding. Nancy and I were in front of them. What the picture does not show is that we were fighting over the muff. Every little girl would love to have a nice furry, soft muff. Even in southwestern Louisiana, little girls love muffs in the winter. They are so soft, so romantic, and so girly. They are very easy to make. I made one when I first got Doris, the first embroidery machine. It was made from some soft faux fur and a pretty mermaid was embroidered on the front. The lining was a satin fabric and a pocket was constructed on the inside. A friend of mine saw it and fell in love with it. I know this because she took it and said “Mine.” I haven’t seen it since. Hope she was able to use it. Oatmeal lowers cholesterol. According to The Mayo Clinic the top 5 foods to lower your cholesterol are: (1) oatmeal, (2) fish and omega-3 fatty acids, (3) nuts, (4) olive oil, and (5) foods with added plant sterols or stanols. We eat the first 4 items pretty regular and now we have oatmeal at the studio in case we want something to eat during the day. High cholesterol can cause strokes. We went out to eat Wednesday night at The Oar House. George bought me a mermaid tee shirt. Reminds me of the time we took our embroidery tech out to eat at this same restaurant. The waitress had not been by our table in awhile so we called the restaurant on my friend’s cell phone and asked the waitress to bring us water. It was all in fun and our waitress, at least appeared to understand and laugh along with us. A scalloped edged handkerchief was designed a few weeks ago. Since that time it appears that all sorts of shaped edges will work for handkerchiefs. An organza hanky was made with multiple scallops along the edges. I don’t think we will be selling that hanky since it occurred to me that since the organza is shear, when you blow your nose, you can see it. Ewwwww. We’ll use the organza for other items, not handkerchiefs. Etsy sales have picked up a bit. We sold another “You have a booger” handkerchief. It always makes us laugh because that handkerchief design has out-sold everything else in our Etsy store. We sell lots of napkins, handkerchiefs, and other items, but that one hanky design always seems to sell. Several friends are heading out to a mermaid retreat on the east coast. They will be gone for five days. During their retreat they will have walking mermaid tails made, a photo shoot, and there was some talk of them performing. Oh my. I can’t wait until they return with all of their stories. A couple of the girls attended a Merpalooza last week in Tampa. There should be some really good stories when these girls return. Now that Christmas has come to mind, I realize that Christmas items need to be made soon or we won’t be ready for the holiday rush. With that in mind today was R&D day, research and development. Card stock can be embroidered. It needs to be embroidered with cross-stitch embroidery; otherwise, the needle and thread can tear the card. Today some old cards were used for embroidery samples and it not only worked beautifully, but metallic thread worked nice, as well. There are several other methods that need to be tried and developed but it sure seems that embroidered Christmas cards may be in our repertoire soon. Continuing with R&D day, the new organza was hooped and embroidered with metallic thread. That worked out remarkably well. This, too, led to additional ideas that will require R&D. The little North Pole sign or even the Christmas lights wreath with the monogram in the center would be perfect for napkins. A friend of our’s loves his Christmas dishes. So much that he would love to use them all year. Do you have Christmas dishes? A set of fanciful holiday embroidered napkins with your monogram would certainly enhance your table setting. day, the kids came back and, one by one, began to tell their stories. pistol, and a survival knife. then she killed the last Iraqi with her bare hands." Not much happening this week other than working hard on this beautiful, large embroidery design. Wednesday I missed an annual pool party at a friend’s home in Navarre. This party is notoriously lots of fun. There was a choice of the pool party or my anniversary. Our anniversary is August 14th. Cajun Stitchery will be closed on Tuesday and Wednesday of this week. There is too much work to close shop for the pool party, too. While perusing one of our online catalogs this week there were some technical difficulties. Having the single best group of girlfriends in the world, I called on them to see if they had problems with the catalogs, as well. They did not. However, there was a bonus. Several of the girls did not realize that Cajun Stitchery sold all of the items in the catalog. We sell so much more than my handicrafts on Etsy and tee shirts. There are all sorts of baby items, laundry bags, accessories, undergarments, blankets, as well as tee shirts and the usual stuff. Also, we sell very nice dress shirts and jackets. You don’t have to have these items embroidered. I’ll be glad to sell them without embroidery. There are two online catalogs; one is the imprintit.biz link, above; and, the other is the companycasuals.com, also above. We learned a valuable albeit hard lesson this week. Last week we had an order on Etsy, which we filled and George took to the post office. The post office worker behind the counter suggested that George mail it via Media Mail and said the customer should receive the package by this past Wednesday, August 7th. She did not. She still has not received it. I called the post office yesterday with my receipt in hand and was told that Media Mail is the absolute slowest method of mailing. The package is en route but could take three weeks to get to its destination. As a business owner you certainly learn to be humble. That was the case when I had to explain this to my customer. We will never use media mail again. Today was a good day since I did my periodic spree at Dollar Tree and purchased lots of items that I don’t need and will never use. This evening George purchased the movie The Thing for our evening entertainment. It was the third remake of this movie, the first one was in 1951 and James Arness (Marshall Matt Dillon and brother of Peter Graves) played “The Thing”. I’ve watched all three and this new remake is by far the best, although the movie never had much of a plot in the first place. The garden is doing fine. We’ve had bell peppers from the garden all year. Now there are some banana, ancho, and jalepeno peppers, too. The carrots are now gone. We ate the last of them this week. There are 3 beautiful eggplant, as well. The yard long green beans are producing now. Our wonderful tomato plant that was planted last year looked as though it was dying out, but lo and behold it has flowers on it, again. Last week I invited a couple of our friends to dinner yesterday. My friend asked what she could bring. I told her that I had not decided the menu at that time and would let her know. Relaying that information to George, he said, “They will expect shrimp. That is what you cook.” So, shrimp is what we had. I definitely need to come up with another main dish. However, no one ever complains about boiled shrimp. The gnomenator is at it again. One girl has received two gnomes and one received a set of 4 Saints gnomes. However, the gnomenator remains a mystery. The horse embroidery turned out to be a success. The Wisconsin customer said it was a gift and the recipient was very happy to receive it. Another order this week came from an Etsy customer who ordered a dozen burgundy napkins with a mermaid with a silver metallic tail. Another Etsy order this week was for one of our fleur de lis embroidery designs. We received a rush order for a couple of Pensacola With Kids logos on running shirts. Most of the week, however, was spent working on the huge embroidered headboard. Almost any design can be embroidered on a laundry bag, beach towel, bath towel, hand towel, or any kind of towel. They make wonderful gifts and are great for wherever towels are needed. Imagine your monogram on a set of towels in your bathroom; all matching each other and embroidered using the color of the room. With a 5-lb potato bag in each hand, extend your arms straight out from your sides. Hold them there as long as you can. Try to reach a full minute, and then relax. Then try 50-lb potato bags, and then eventually, try to get to where you can lift a 100-lb potato bag in each hand and hold your arms straight for more than a full minute.